The Impact One-Light Umbrella Kit is built around the Impact 12" Floodlight. It's made of heavy-grade aluminum, hand-spun and chemically etched to maximize the light output. The reflector has a black painted exterior. The socket has a high-heat capacity, with a wooden handle and in-line power switch. This kit is designed for use with 110-120 voltage. It accepts screw-on aluminum reflectors of different diameters. 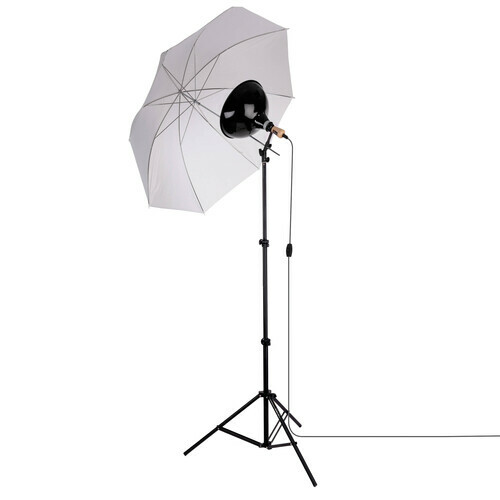 This kit also includes a white, translucent umbrella, 500 watt bulb and air-cushioned light stand. The Impact Porcelain Socket with Umbrella Mount (500W) is a cost-effective way to utilize a wide variety of E26 (Edison) based lamps for photo or video work. Options include simple household lamps as well as photoflood and quartz halogen bulbs. This highly versatile product has an adjustable metal mount with a 5/8" receiver for light stands and an 8mm umbrella receptacle. The Floodlight Socket tilts and locks in place at the desired angle by grasping the stay-cool wooden handle and releasing the locking knob. Lamps up to 500W won't melt the ceramic base which is impervious to heat. The socket also accepts screw-on reflectors of various sizes. Impact Floodlight Reflector - 12"
Replacement Reflector for the Impact 12" Floodlight. Made of heavy-grade aluminum, are hand-spun and chemically etched to maximize the light output. Black painted exterior. The reflector mount size is 1 5/8". Umbrellas soften, broaden, and diminish the light output of any flash light source. Umbrellas with a white interior will soften and weaken light more than an umbrella with a silver lining. A white umbrella without a black backing may also be used as a makeshift softbox, although the use of the light will not be as efficient as with a lightbox. This Impact 43" White Translucent Umbrella is suggested for use in mid-length portraits for one or two persons. 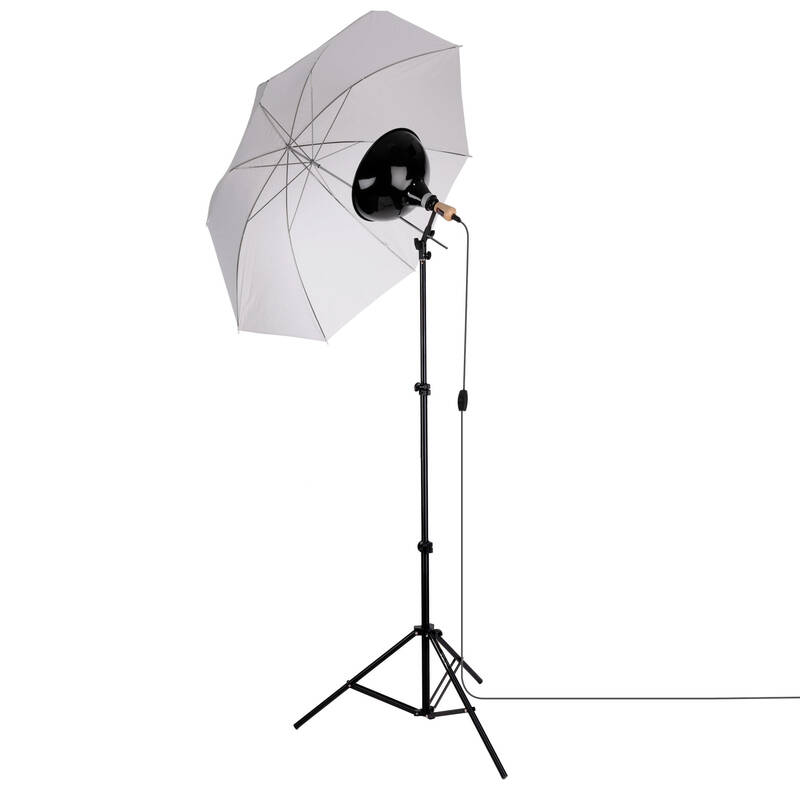 This 6' Impact Black Light Stand is one of the most economical light stands available. It has a 5/8" stud top with a 1/4"-20 thread. For small light fixtures or boom arms. This Ushio ECT Photoflood (500W/120V) is an incandescent bulb with an E26 (Edison) screw-in base compatible with lighting fixtures that have a 500W rating. It has a color temperature of 3,200K and an average life of 60 hours. Box Dimensions (LxWxH) 8.05 x 5.85 x 4.15"
Box Dimensions (LxWxH) 11.95 x 11.75 x 8.55"
Box Dimensions (LxWxH) 29.0 x 2.7 x 1.65"
Box Dimensions (LxWxH) 26.4 x 3.5 x 3.5"
Box Dimensions (LxWxH) 6.3 x 3.45 x 3.25"
One-Light Umbrella Kit is rated 4.0 out of 5 by 1. Rated 4 out of 5 by Kevin from Decent buy for the money I bought this to add to my studio set up. I think the light is top notch, and like the umbrella bracket very much, but mine shipped with the light, and stand adapters backwards. Easy fix, if you know what your doing. I think the provided stand might be a little weak for this set up, but I used a different stand, and used the included one for a smaller light. If your using the stand supplied, I'd think about using a sand bag to steady it more. Over all its definitely worth the money.